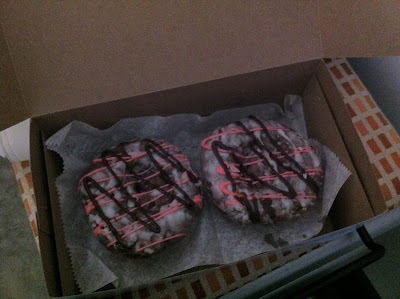 I picked up a half dozen of these beauties from 'Sublime Doughnuts' on my lunch break today. I gave a few away back at the office, but I still have (4)... correction (3) left to make some paintings with eventually. The selection there was more taste-based amazing than visually amazing today, which was a bit of a disappointment, but these little guys totally stuck out. So I had to make sure they made it back home to the studio to begin the process of becoming immortalized.